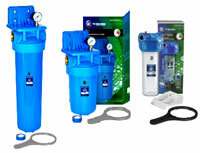 Domestic water filter systems are becoming increasingly popular as public awareness of water quality issues increases. In line with this growing market, we have available a range of drinking water filtration and treatment systems to suit most domestic and small commercial applications. The correct product for you will depend upon the particular problems that you experience with your water supply. If it is simply a question of improving the taste and overall quality of your water then either a Chem-Pro or Eco-Pro System will suffice. If complete removal of heavy metal contaminant is required then a HM-Pro System will provide the answer. 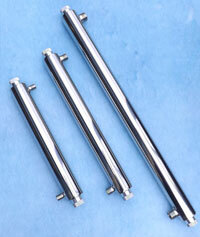 We can also offer a range of Reverse Osmosis and Ultra Violet Systems. Our range of Undersink domestic UV units provides a simple and effective way of eliminating bacteria from your drinking water. Our range of Undersink domestic UV units provides a simple and effective way of eliminating bacteria from your drinking water. The smallest of the units (UV-PRO1) is a 22 litre per minute system that has been designed to mount on the side wall of a 600mm deep undersink cupboard and yet allow the UV lamp to be changed without having to remove the unit from the wall. You simply need to disconnect the lamp and remove it and replace and reconnect the new lamp. The water does not need to be turned off and the whole lamp change process is carried out in a couple of minutes. This simplicity of use means that the services of a plumber to replace the lamp is a thing of the past and represents a real leap forward in design of Undersink UV for water treatment. UV-PRO2 and UV-PRO3 units are designed for the larger property but their compact design means that they may be fitted quite unobtrusively in a position where lamp access is readily available. Solid state electronics across the range of UV-PRO type UV water treatment units means long life and reliable performance. Our range of Undersink domestic UV units provides a simple and effective way of eliminating bacteria from your drinking water. The smallest of the units (UV-PRO1) is a 22 litre per minute system that has been designed to mount on the side wall of a 600mm deep undersink cupboard and yet allow the UV lamp to be changed without having to remove the unit from the wall. You simply need to disconnect the lamp and remove it and replace and reconnect the new lamp. The water does not need to be turned off and the whole lamp change process is carried out in a couple of minutes. This simplicity of use means that the services of a plumber to replace the lamp is a thing of the past and represents a real leap forward in design of Undersink UV for water treatment. A greater public awareness of contamination in water supplies has occurred in recent years which, in turn, has resulted in the successful application of alternative methods of treatment. Chlorination has been used worldwide since its introduction in 1847 because of its disinfection power and long retention time. Unfortunately when water supplies are chlorinated, it is know that toxic chemicals called Trihalomethanes (THM's), suspected carcinogens, can also be produced in low concentrations. Complaints about taste, smell and eye irritation are common for chlorinated water which the consumer has suffered for many years. In many applications, an ultraviolet disinfection system can provide an effective solution byremoving the need entirely for chlorination or by allowing much reduced levels of chlorine to be used. Many local supplies, particularly in remote areas, are only partially or wholly untreated at source. Inevitably, this can lead to outbreaks of stomach upsets, gastroenteritis and many other more serious diseases. UV treatment can effectively eliminate bacteria associated with CHOLERA, JAUNDICE, DYSENTERY, TYPHOID, and LEGIONNAIRE'S DISEASE as well as destroying viruses such as POLIO, INFLUENZA and HEPATITIS. A practical and economical solution is the installation of a UV-PRO disinfection system at point of use. In sufficient doses UV light in the wavelength range of 200 - 280 nanometers disrupts the DNA of microorganisms which results in the death of the micro-organism. We are pleased to be able to introduce to our product range these prefilter kits that are ideal for use as prefilter units for domestic UV installations. The units may be supplied just as a housing installation or complete with a choice of filter cartridge to make the kit complete. 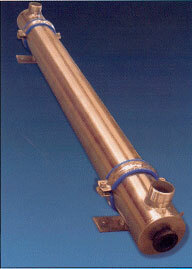 All housing kits include the filter housing, wall mounting bracket and bowl spanner. The GAC (granular activated carbon) cartridge is used in the Chem-Pro System and will require changing every 6 months depending upon the amount of flow through the system and the level of contamination. Purchasers of the new Chem-Pro System will be contacted by Prosep every 6 months and reminded that the GAC cartridge may need changing. The HM-Pro System comes complete with a cartridge set comprising of a polypropylene pre-filter and a biquette carbon final filter which enables the removal of heavy metals such as lead, iron, aluminium, mercury and cadmium from your drinking water. This cartridge set may need replacing every 6 - 12 months. Again, this depends upon the flow of water through the system and the level of contamination. Purchasers of the HM-Pro System will also be contacted by Prosep every 6 - 12 months and reminded that the cartridge set may need changing. 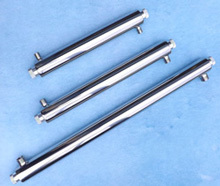 The chrome tap supplied as standard with your filter system comes complete with tubing attached. This allows for quick and easy installation of your new domestic water filtration system.